Low friction rails allow for a smooth glide of the fixture. Non-contact footing reduces abrasive film wear. Magnetic specimen mounts allow rapid and easy removal of specimens for viewing. Peek-thru aperture in the magnetic specimens mounts allow for transmitted light viewing. Variable loading is optional by adding weights or finger pressure to the top of the fixture. Micrometer depth control allows precise control over specimen thickness. Precisely crafted stainless steel construction ensures long life and high precision. This newly introduced Lapping and Polishing Fixture, which is designed to accurately produce polished parallel, tapered or critically oriented samples with minimal sub-surface damage. Derived from the Model 195 MultiLap™ Polishing Tool, the Rail Polisher version exhibits significant difference from the model 195 MultiLap. The employment of the rail guide system allows for precision hand polishing of delicate specimens, which may be damaged on rotary polishing machines. Additionally, the rail guide system employs a non-contacting base, reducing wear on many types of abrasive films and media. The Rail polisher incorporates up to 3 separate pistons, which are used for holding the specimen during preparation and controlling the amount of material to be removed. Specimens up to 1" in diameter can be polished with controlled material removal for rapid viewing of the specimen in the light microscope. Also the magnetic mounts have a circular aperture, which provide means for viewing the specimen in transmitted light. Overall, the Rail Polisher is a versatile instrument for performing any controlled material removal process in the laboratory. The micrometer method of thickness control employs a dial with 10Ìm graduations that is adjusted relative to the outside support ring to set the amount of material to be removed. To set the dial, the sample is initially zeroed against the flat surface of the rail system and then the dial is adjusted to create a gap between the outside support ring and the center slide. This gap corresponds to the amount of material to be removed and gradually decreases, as the sample is lapped or polished, until the final thickness is reached. Due to the ease of adjustment, a micrometer controlled fixture is generally used when desired sample thickness will vary from sample to sample. EMS offers many different fixtures, which are suited for multiple applications. For example there are small fixtures such as the model 145 used in processing TEM and SEM specimens. Larger specimens such as wafers or optical devices can be processed using the model 150 or 155 lapping & polishing fixtures. Specific applications such as edge polishing can also be accommodated with special mounting blocks or special fixtures such as the models 147E or 155E. Additional options are available for most fixtures such as vacuum mounting and higher resolution thickness control by means of a digital indicator. 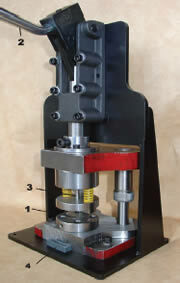 The Rail Polisher is available in either a one channel or a three channel model. Sample Mounting Fixtures are available with One Piston, Two Pistons or Three Pistons. The METALTHIN Twin-Jet Electropolisher was originally developed for producing high quality thin foils from radioactive materials. It is robust, compact, economical and easy to use. The electrolyte tank, sample holder, thinning cell and tank base stand are machined from solid PVC to provide maximum resistance to corrosive electrolytes. The Cell parts are held togetherby stainless steel screws so that the Cell is easy to disassemble. The METALTHIN Mk4 system incorporates the accumulated experience of many years of use in Universities, Industrial and Nuclear Research Centers and comprises Thinning Cell and Control/Power Supply plus the optional Unipump and Dewar Flask. The thinning cell is contained in an electrolyte tank that press fits into a solid PVC base stand especially designed to collect drips of electrolyte. An additional electrolyte tank is provided for washing the cell after use. The electrolyte is pumped from the tank into the thinning cell and jets by an impeller pump driven by a 12v dc motor. A stainless steel plate fitted to the base of the motor protects it from the corrosive electrolyte vapour. The pump motor cover is easily removed so that lead sheet may be placed around the motor to shield it from radiation, if required. The photo-cell detector and light source plug into sockets at the ends of their respective leads. They are protected from corrosive electrolytes and ionising radiation by screw-on stainless steel housings that push-fit into the thinning cell. Perforation can be determined by eye when the photo-cell detector is removed from the cell. This is necessary if composite specimens of 1mm discs pressed into 3mm discs are to be thinned because perforations occurring at the interface must be ignored. Such composites can substantially reduce the amount of radioactivity and magnetism because only the 1mm disc is the radioactive or magnetic specimen. Thinning from one side only is achieved by placing a thin piece of glass over the disc. The glass is held in position during electropolishing by the screw-in portion of the disc holder. Hazards associated with the use of inflammable/corrosive electrolytes and their disposal are reduced by the low volume (100-220 ml) of electrolyte required. The thinning cell may be sited remotely from the power supply to protect the latter from corrosive electrolytes and radiation. A stainless steel cooling coil is an integral part of the thinning cell. It has three turns and the resulting increased surface area improves the cooling speed and temperature control. The photo-cell detector and light source plug into connectors at the ends of their respective leads. The photo-cell detector and light source are contained in stainless steel housings that push-fit into the thinning cell. A base stand that holds the thinning cell securely and collects drips of electrolyte. An additional electrolyte tank is provided for washing/cleaning the thinning cell. The impeller screws onto the pump shaft. Push-on electrical connections facilitate setting up and operation. The base of the pump motor is protected from the electrolyte by a stainless steel plate. New Feature: Changes in the design of the specimen holder have improved the holding of thin discs at low temperatures. Completely separate from the thinning cell and cannot be operated until a key is inserted into the main switch and turned. control of the electrolyte flow rate. control of the coolant flow rate through the internal cooling coil. control of the dc current to the electrodes. illumination of the disc and detection of perforation followed by automatic cessation of electrolyte flow and dc current. option to apply a small reverse potential i.e. cathodic protection to the disc when perforation is detected. option for an audible alarm to sound when perforation is detected. A key operates mains switch. A switch to cancel automatic tripping of electrolyte jetting so that jetting can continue after perforation without the dc current applied to the thin foil. A switch that introduces a 20% variation in the dc current. This may assist in the retention of particles in multi-phase alloys. Thinning current control: During the thinning process, small changes in electrical resistivity are caused by variations in the temperature of the electrolyte and by the thinning process itself. the CONTROL CURRENT facility automatically maintains the current that is initially set by the operator. This avoids the need to constantly monitor and adjust the setting. The range of cell resistances to which automatic control of the thinning current can be applied are those that apply to the majority of electrolytes. If the conditions are outside the range of automatic control, the control current switch will flash to shwo that manual control is required. The external case has greatly increased strength and resistance to corrosive electrolytes. The electrical and instrumentation leads plug into the rear of the power supply to protect the connections from accidental contact with the electrolyte. The push switches are arranged in a single line on the front of the power supply. The push switches are fitted with flexible transparent covers to protect them from accidental contact with the electrolyte. The voltage and thinning current are displayed digitally. The various leads from the power supply to the thinning cell are gathered togethere to form a multi-cable contained in a flexible spiral wrap. The gaps between the spirals are sufficiently wide to allow accidental spills of electrolyte to be washed away. The length of the standard connecting cable is approximately 1.5m. Different lengths up to 5m will be supplied on request at no extra charge so that the thinning cell may be placed in a fume cupboard/glove box remote from the power supply. The individual leads are standard items that can be easily replaced. Push-on fittings connect the dc supply to stainless steel spade terminals on the Cell top. The basic METALTHIN, developed in the early 1970s, is a fully tried and tested product that produces good quality foils. The contstruction of the Thinning Cell and Specimen Holder is very robust. The only replacement parts that a user is likely to need are stainless steel screws, platinum foils and the screwed inserts for the specimen holder. We believe that no other twinjet polisher has all the functions included in the Mk4 control/power supply. The initial price of the Mk4 is competitive. The small electrolyte volume results in substantial savings in running costs over the years and increased safety. The key controlled mains switch prevents unauthorized use. Changes in the design of the specimen holder have improved the holding of thin discs at low temperatures. The thinning current can be controlled automatically. The push switches have transparent flexible covers that protect them from electrolytes. All the cables linking the power supply to the thinning cell connect via the rear panel. The cables are standard type. Each one may be replaced easily at minimum cost. The UniDisc is designed to produce 3mm diameter discs for electropolishing, and subsequent TEM examination, from sample strips. Sample strips are fed into the side of the UniDisc. When the handle is pulled, the strip is trapped between two rigid metal die faces. The punch then pierces the tightly held sheet and ejects the disc into the collection tray. Deformation is confined to a much localized shear zone at the edges of the disc away from the central region which is later thinned using either the twin jet electropolisher or the single jet electropolisher. The punch and die are replaceable items made from hardened tool steel. The standard model produces 3mm discs for TEM from sheet/foil samples with minimum distortion. Optional models produce discs from 1mm to 6mm in diameter. Examples of the use of these includes the production of 1mm discs of highly radioactive materials which are pressed into holes punched in non-radioactive 3 mm discs and the composite disc thinned. This reduces the radiation dose to the personnel involved. The larger disc specimens are used in SEM. The standard UniDisc Mk2 is used for making 3mm disc from samples 0.004 to 0.006" (0.10 to 0.15mm) thick i.e. the optimum for electro polishing. If the thickness of the sample is outside the 0.004 to 0.006: range, the same punch is used but the die has to be changed because a different clearance between the punch and the die is required to make good flat discs without any flash around the edges. Discs can be made from materials up to and including 1mm thick stainless steel. To order non-standard 3mm die quote: the source material and thickness. Punch and die sets and/or individual punches and dies can be supplied to produce discs in the range of 1 to 6mm in diameter. To obtain advice on the feasibility of your project quote: the diameter of the disc required, the thickness and type of the source material.